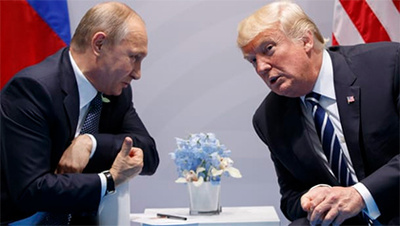 In his last interview before flying to Helsinki to meet with Vladimir Putin, the US president Donald Trump, summarized what we have been sensing and suspecting for long time: The European Union is a foe. The very same day in another conversation with reporters he said that Putin could be a friend. Foe: an enemy or opponent. Synonyms: enemy, adversary, opponent, rival, nemesis, antagonist, combatant, challenger, competitor, opposer, hostile party. The U.S. State Department, in its most recent human-rights report, described restrictions in Russia on political participation, the suppression of civil society and allegations of torture. Human Rights Watch said that the government had “tightened control over the already-shrinking space for free expression, association, and assembly and intensified persecution of independent critics." An authoritarian figure under suspicion of murdering opponents. Erdogan accused members of democratic institutions of being part of a failed coup attempt against him the previous year. The U.S. State Department has cited “inconsistent access to due process” in Erdogan’s Turkey, along with other abuses against civil society. Human Rights Watch called the new presidential system “a setback for human rights and the rule of law.” Trump’s “personal relationship” with Erdogan appears to have its limits, however. Turkish forces are pounding a Kurdish-controlled Syrian town despite pleas from the U.S. to obey a 30-day UN-mandated ceasefire. Recep Tayyip Erdogan is literally practices genocide against the Kurds in Turley, Iraq, Syria and everywhere else he can reach them. The 2013 report on the situation of human rights in North Korea by United Nations Special Reporter Marzuki Darusman proposed a United Nations commission of inquiry to document the accountability of Kim Jong-un and other individuals in the North Korean government for alleged crimes against humanity. The report of the commission of inquiry was published in February 2014 and recommends making him accountable for crimes against humanity at the International Criminal Court. Other “friends” of Donald Trump and today’s USA include: Xi Jinping, China; Abdel-Fattah el-Sissi, Egypt and a couple of dead dictators: Moammar Gaddafi of Libya and Saddam Hussein of Iraq. He admired both for the …stability they brought to their regions! But who’s in friendly terms with the US president in EU, because there are not all ...“foes”. - Viktor Orbán, Prime Minister of Hungary and leader of the nationalist far-right neo-Nazi Fidesz party. Hungary under his rule has become a xenophobic, racist country with no freedom of press and independent judicature. Immigrants and Roma are often victims of covered hate crimes by paramilitary groups attached to the Fidesz party. - Mateusz Morawiecki, Prime Minister of Poland. The EU Commission in a report about the judicial situation in Poland concluded that there was a “clear risk of a serious breach of the rule of law in Poland” and asked the national governments in the Council of the EU to vote on whether they agree. This could eventually lead to the suspension of Poland’s voting rights in the EU and to other sanctions, including the withdrawal of EU funding. Let’s see now his FOES and let’s start with his worst foe! Justin Trudeau, the current Prime Minister of Canada and Leader of the Liberal Party. The man is most like favoured and admired from all 191 countries of this world minors ….Trumpland. He even managed to make Melania Trump smile a couple times and that is a Herculean achievement on its own. Other foes include definitely Angela Merkel, the German Chancellor; Donald Tusk, the President of the European Council; Jean-Claude Juncker, President of the European Commission; Charles Michel, Belgium's Prime Minister; Emmanuel Macron, President of France; surely the socialist Stefan Löfven, the Swedish Prime Minister. In his foes you might include Britain’s Theresa May after his official visit there and her acknowledge that he is a bit …out there when his suggestion to end all hassle with the Brexit was for her to …sue EU. This man now is in Helsinki Finland to “negotiate” with Vladimir Putin for the future of this world and judging from the ...success he had negotiating with North Korea’s Kim Jong-un, the only thing I can say is …say goodbye to Ukraine. And a warning to my friends in Finland: Finlandization doesn’t always work well with Donald. It is also time for the EU leadership to deal with Donald Trump the same way they deal with Kim Jong-un, Recep Tayyip Erdogan or Vladimir Putin. The man is a grotesque authoritarian and Hitlerian caricature; a foe to human rights, an enemy of the environment and nemesis to humanity in general and that’s how he should be dealt as such. Let’s do what we should have done with Hitler long before 1938, stop him and his cronies all around the world now.